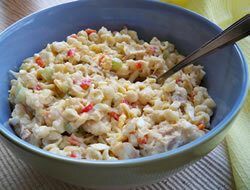 A versatile pasta salad that can be changed up with the addition of tuna, chicken, or ham. Make it according to what will go best with your dinner that day. Cook the pasta shells according to package directions; drain and rinse with cold water. Set aside. Cook the hard boiled eggs. Drain and cool in cold water. Peel the eggs; then remove the yolks and mix them with 1/4 cup of salad dressing and 1/4 tsp. of salt until mixture is smooth. Chop the egg whites and add to the yolks. Set mixture aside. In a large bowl, add the salad dressing, milk, sugar, onion salt, salt, and pepper; stir until smooth. 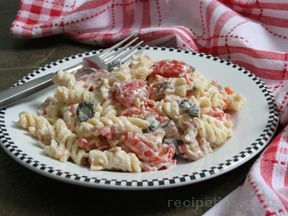 Add the pasta shells, egg mixture, celery, cheese, and red peppers; stir until everything is evenly coated. 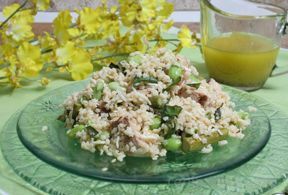 Add tuna, chicken, or ham; stir together and refrigerate until chilled. 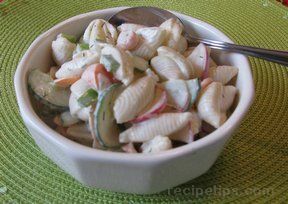 "This pasta salad was pretty good but I had to use tuna and I think I would have liked it better with chicken or ham. Next time I will only add 4 hard-boiled eggs. I loved the extra flavor that the red peppers added to the salad."